The pinus nigra in its prime. The Oxford Botanic Garden has announced that its large black pine (pinus nigra), one of Tolkien’s favourite trees, will be cut down for safety reasons. Two large limbs fell from the tree last weekend, and Oxford City Council and Oxford University have been forced to make the very difficult decision that the tree will need to be cut down to avoid endangering the safety of its visitors and staff, and nearby structures. Acting director of the Garden, Dr Alison Foster, has announced their intention to celebrate the tree and its connection with Tolkien. The black pine was a highlight of many people’s visits to the Botanic Garden and we are very sad to lose such an iconic tree. We intend to propagate from this magnificent tree so that future generations will not miss out on this important link to Tolkien. We are considering using the wood from the black pine for an educational project along the lines of the One Oak project and hope to hold a celebratory event to commemorate the tree and its many associations in due course. The Oxford Botanic Garden has been in contact with the Tolkien Society about what form the commemoration and educational project could take. Tolkien hated the wanton destruction of trees for no reason but it sounds to me like this is for all the right reasons so whilst this is sad news, it is inevitable. 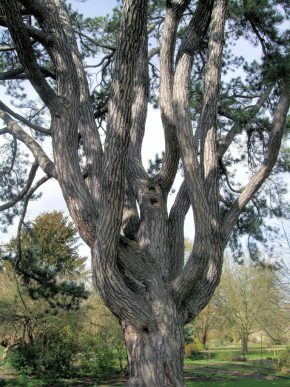 It is often said that the black pine inspired the ‘ents’ in Lord of the Rings, and it may be he liked the tree and saw something it in that inspired Treebeard, but in fact the ‘ents’ have many sources and ‘ent’ means giant in Old English, and Tolkien’s love of trees goes all the way back to his childhood. Read the press release in full, where you can also see a picture of the tree in its current state with the two fallen large limbs. UPDATE: The Oxford Times has posted video of the moment the tree collapsed, along with a timelapse video of the tree’s felling.